For the lemongrass purée: Wash the lemongrass stalks. Remove all the white powder from the leaves. Cut the stalks in half. Bruise the younger part using a mallet and reserve for making the broth. Cut the remaining stalks into extremely thin slices using a sharp chef's knife. In a mortar and pestle, grind the thin slices of lemongrass, then transfer and mix everything using a mini food processor. It should turn into a fine, moist powder. Set aside. In a pot, soak the beef bones in about a quart of water with 1 tablespoon of salt overnight. The next day, rinse the bones and beef shanks, place them in a pot and cover with water. Bring to a boil and cook for 5 minutes. Drain the water. Rinse the bones under running water and set aside. This step is important to get clear broth before starting the long slow-cooking. Char the ginger: Wash the whole unpeeled ginger; pat dry. Place a grill on your stove, then char all the skin of the ginger. Wrap in aluminum foil. Let cool for about 10 minutes. Wash the ginger under running water; the blackened skin will come right off. Bruise the ginger using a mallet to loosen the flesh and help release its flavor. In another stockpot, heat some oil. Add 5 shallots. Cook over medium-low heat for about 10-15 minutes, stirring frequently to prevent the shallots from burning, until the color is evenly golden brown. Increase the heat to the highest setting and place the beef bones and beef shanks, 2 tablespoons of puréed lemongrass and the reserved lemongrass stalks. Sear the beef shanks until golden. Add 2 tablespoons of fish sauce. Stir for a minute and remove the beef shanks and transfer to a platter. Add the charred ginger and whole yellow onion to the beef bones. Cover with boiling water. Bring the liquid back to a boil, then lower the heat to a bubbly simmer. Cook for about 30 minutes and add the beef shanks, then cook for an additional 1-½ hours. Regularly skim the impurities rising to the surface of the broth using a fine mesh strainer. Add salt, mushroom powder, rock sugar and MSG if you choose to. Cook for another 30-45 minutes. Fish out the beef shanks using a slotted spoon; transfer to a cutting board. Allow to cool and slice the meat (no need to slice them too thin). Make sure the beef shanks are sliced against the grain to ensure optimum tenderness. Remove the beef bones, cover with cold water and set aside for about 15 minutes. (Note: The method used to ensure that the meat does not darken as the broth cools down is basically the same procedure as that used to keep vegetables a bright green color). Drain the water from the beef bones, then refrigerate until it's time to serve. Leave the broth on the lowest setting of your stove while making the sate chile sauce. Finely chop 5 red Thai chiles; reserve the rest as garnish for later. In a small pan, heat the oil and add the chopped garlic and shallots. Cook until slightly golden. Lower the heat. Add the rest of the puréed lemongrass and the very finely chopped red chiles. Cook for about 5 minutes until very fragrant. Let cool a little and blend the mixture in a mini-blender (this step is optional). Add sugar, red chili powder, paprika and the fish sauce. Stir well and add a ladleful of the broth. Pour all the contents of the saucepan into the big stock pot. The broth should be red, fragrant and properly seasoned. 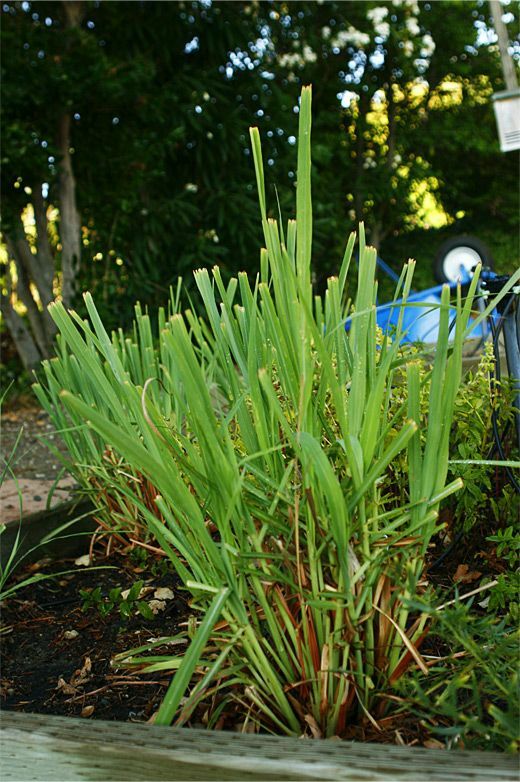 Remove and discard the lemongrass stalks. Let the soup come back to a boil for a last time, then remove the pot from the stove. It's ready! 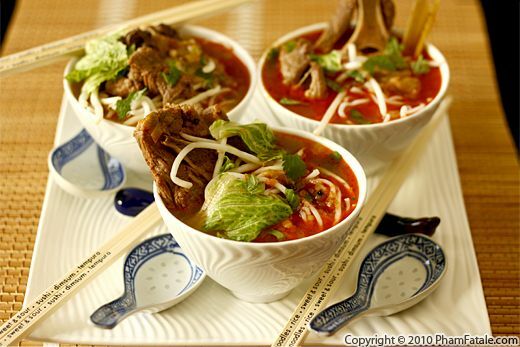 Fill each bowl with rice noodles, sliced white onion, beef bones and the sweet spicy broth. Serve immediately. Garnish with chả lụa gà pieces, lime wedges, bean sprouts, red cabbage and the Asian herbs on the side. I used thick rice vermicelli noodles. You can find them in Asian stores. 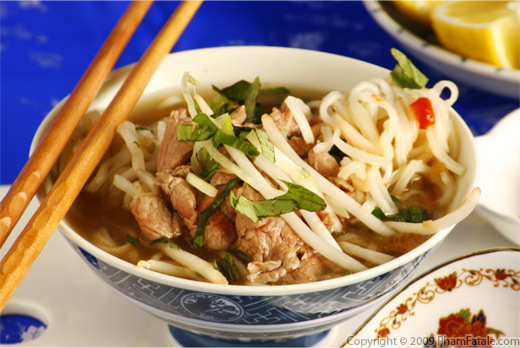 The key to a good bún bò Huế is good, clear, fragrant broth. Cooking very slowly and gently keeps the broth relatively clear. It's very important to get rid of the foam that rises to the surface of the broth as it cooks. Never bring the broth to a full boil, always keep a gentle simmer. Also to ensure a clear broth, if the broth is too salty, only add boiling water, NO cold water. I usually have a kettle of boiling water on the side. I purposely do not salt the broth at the beginning, but wait to add salt and sugar until the bones and beef shanks are fully cooked. 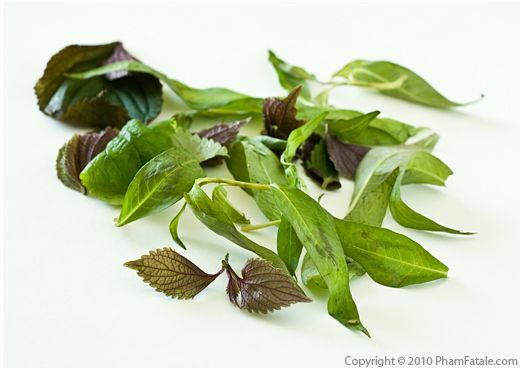 Tía tô are Vietnamese perilla leaves; they are green on one side and deep red-purple on the other side. 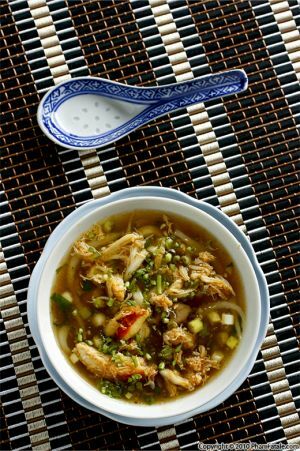 They're a very common garnish in simmered dishes and rice vermicelli noodle dishes. Rau răm is another Vietnamese aromatic herb that is an acquired taste for someone who's not familiar with it. My husband Lulu is not a big fan. I would describe the flavor as spicy coriander, and it goes very well with chicken; I use it for cơm gà Hải Nam (Vietnamese chicken rice dish) and gơi gà (Vietnamese chicken salad). I recently bought a plant at my local nursery. It's called "Vietnamese coriander" at Summer Winds Nursery, 725 San Antonio Rd, Palo Alto, CA 94303. Ngò gai, literally spiky cilantro in Vietnamese, is a strong cilantro-flavored herb that is traditionally served in the can chu soup. It's a love-it or hate-it kind of herb. You can find rock sugar in any Asian stores. You can also use granulated sugar. Vietnamese mint has a very different flavor from regular mint. It also has darker vein markings on the leaves. It's commonly used in Asian salads such as Vietnamese chicken salad and also in Vietnamese spring rolls (gỏi cuốn in Vietnamese). You've probably seen those industrial, dark-colored, gelatinous blocks of congealed pig blood, called huyết. I don't use this product. I used to buy lemongrass at Asian markets. But I recently asked Lulu (my husband) about it and he started to grow 4 "bushes" last year, so we keep getting more (especially during the summer), which is very convenient. It's a perennial. You can find chả lụa gà (Vietnamese-style chicken ham; it's a thick cold sausage that is tightly wrapped and steamed in banana leaves) in Asian stores in San Jose. Our family friend Jeannie steams her own at home. Delicious! When you're ready to serve, you can serve fermented shrimp paste (called mắm ruốc in Vietnamese) but again, I personally am not a big fan. I like fermented fish sauce instead for a salty note. 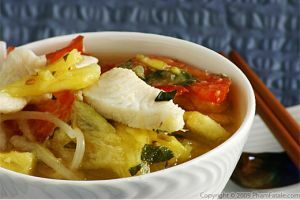 For more Vietnamese soups, check out the recipe for bún riêu or súp măng cua. Published By: Jacqueline Pham on May 13, 2010.